The human tendencies are a driving force that allows for the natural development of the individual's personality and his adaptation into a person of his time, place and culture. 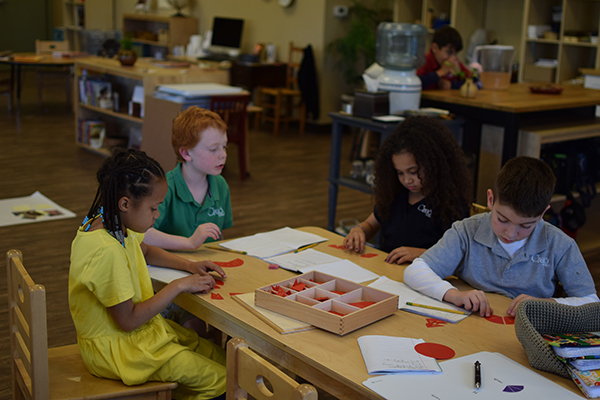 Montessori education supports the expression of the human tendencies and takes them into account to create an environment in which the child can learn and develop in an optimal way. 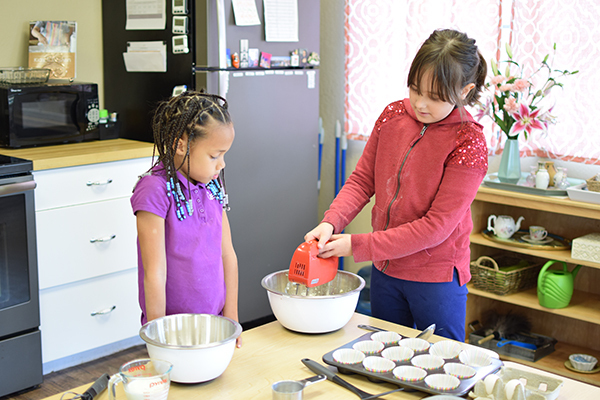 The lessons, study groups and prepared environment interact with the child's activity and allow the child to put into motion the task of self-construction. For the purpose of this article, we will be focusing on three Tendencies: Orientation, Exploration and Order. 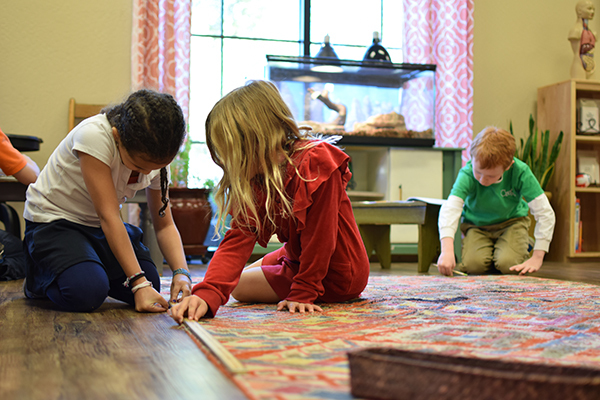 We will look at how these three tendencies are naturally assisted in their development in the Montessori Elementary environments so the child can reach his or her full potential. Orientation is a function of the mind involving awareness of three considerations: time, place and person. The need to figure out "who AM I in relation to my environment" is the prime drive for the child's self-development. The child seeks out the answers to the questions: Where am I? Where are things found? Where am I in respect to my surroundings? What do I need to be doing at this time and what are others doing? Part of the child’s orientation will include connecting with his peers and Guide. The child will get a sense of what his or her role is within the society of the culture of the classroom. Conversations on Grace and Courtesy are key to molding behavior that will bring cohesiveness and harmony in the community. An example of the norms would be: keeping cubby tidy, not walking over rugs, voice control, proper etiquette at table, etc. In addition, to the social orientation the child will become oriented to the routines of the classroom (snack, lunch, clean up to go home, etc.). Exploration involves a search or effort to achieve or discover something. Early human beings fundamentally focused their energies on the need to find food and required the development of the urge to explore. Ancient humans hunted and gathered; today we still have the same need for food even though how we seek it has changed. Younger children explore with their senses. Elementary children explore with their imagination. They want to know: Why does it rain? How does the tide happen? etc. As the child imagines "I wonder ..." then he goes out to explore the world on the hunt for answers. They observe, reason and abstract. 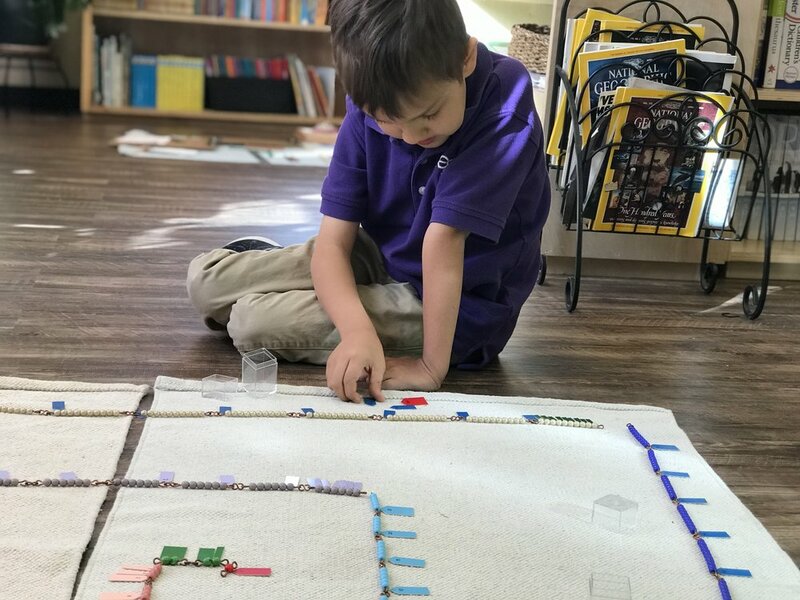 In the classroom, we observe exploration in progress as children work and attempt to apply what they learn and experience to different scenarios or problems. Either an experience out in the world or in the classroom, the tendency to explore is prevalent and necessary for the child to emerge with a unique personality that s/he has self-constructed. The foundational benefit of the human tendency to Order is the natural work of developing intelligence of order and logical thinking. Humans need two types of order: internal and external. 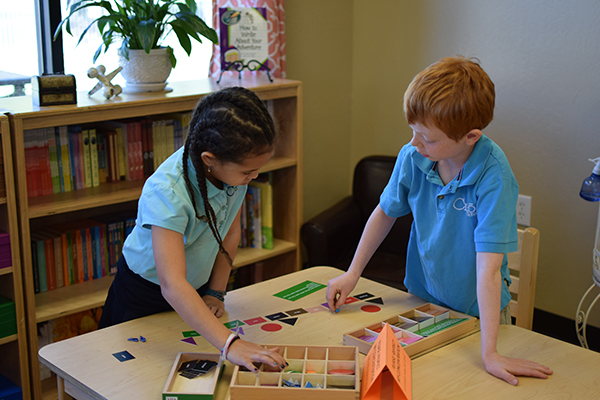 By providing an orderly classroom or environment, the child can develop a sense of internal order, which opens up the possibility to then create external order. Humans are born with the hunger to explore the world, to know their place in the world and the need to find a way to hold all the information gathered through their experiences in their mind for the sake of survival. Order is the natural tendency that works towards classifying, categorizing and placing in the mind all the knowledge and information gathered by the human experience. In the second plane of development the child is engrossed in the activity of exploration and subsequently orientation comes hand in hand to create a sense of grounding. In the line with seeing what’s in the world, and the where it is, the next common thread of necessity is then the work to organize all their findings in categories of purpose. 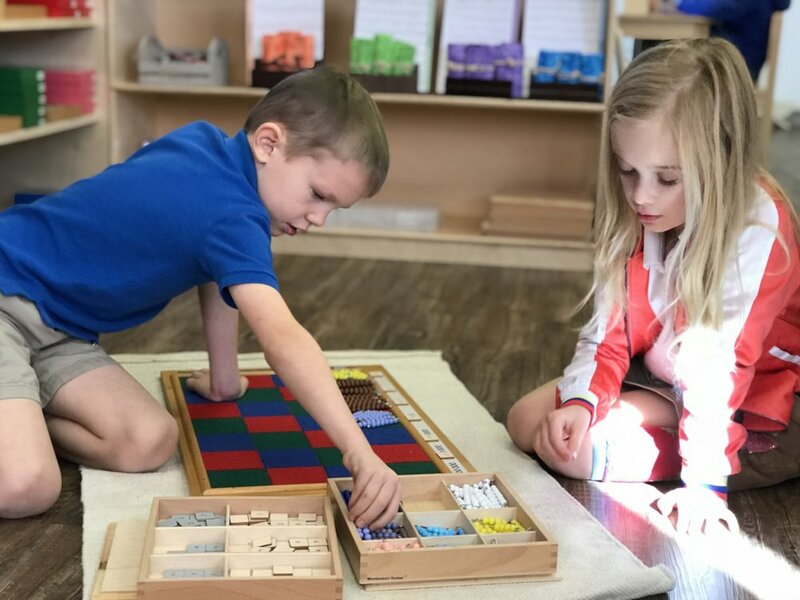 The Elementary prepared environment provides the child with ample opportunity and materials to put into action the need and tendency of the child to organize and categorize. The classroom environment offers the beginning tools to set the tendency of order on the right path. By offering controlled sets of practices such as the classification of animals: vertebrates or invertebrates; types of polygons; or types of seeds the world opens up to the many things that can be explored and repeat the same process of analysis, classification and put into order. The child becomes an innate and efficient classifier, categorizer and archivist. The gift of giving the child access to opportunities to practice orientation, exploration and order is to open up the his/her creative mind to develop. All work leads to analysis, synthesis, and reasoning when its accomplished through self-discovery. The reasoning mind will look at its results and inevitably draw conclusions. A group effort to learn how the verb changes with the use of pronouns and tenses. Learning names of different parts of rectangles flowed into the measurement of perimeter of rectangles found in the surrounding environment. How does the root grow? Learning names of root parts sparked an interest of looking at real specimens under the microscope. What is the law for particles (atoms)? Hot air rises and expands. After grasping the Division Algorithm with the lavish Montessori concrete materials the prepared mind moves to abstraction and is ready to solve division problems on paper. Physical activity, dance, singing, and working together to form a united spectacle. Understanding the use of language of description in a concrete way and decision making process. Effort to learn and retain information is built into the practice of knowing: How I learn best. A group decision to create a timeline of the Presidents of the United States. Working collaboratively to complete a Big Work. Explorations of how common fractions work with each other. It has been a very busy month in the Coyote classroom. Students are busy with new projects in all areas and disciplines. In addition, the children are eagerly exploring and creating groups to discover new areas of interest. Political Geography and History have merged together into big works of research. The study of flags, their symbols and meaning merges with questions about war and how it impacts human development in a country. The Atlas has not returned to its shelf this month. The children are mapping out rivers, mountains ranges, countries, capitals and seeking to know the parts of a mountain, the relationship of rivers to mountains. At a larger scale others are investigating the benefits of the Earth’s tilt and the implications. Also, many have taken to heart the reading of autobiographies and creating summaries. In the area of Biology children are exploring farming, roots and their function. Math work surrounds the notion of big numbers and measurement. The children are exploring Least Common Multiples, addition, multiplication, and division work using the concrete material and gaining proficiency to move to big numbers. The going outs to the grocery store was a major work of story problems: tripling recipes, converting units of measure, figuring out a cost analysis. For the sleepover the children proved to be very capable of using their math concepts to real life applications. Children are exploring many aspects of the Grammar work and expanding their understanding of language through analyzing sentences. Writing poems and small skits is also an activity that has captured interest this month among our Coyotes. It has been a wonderful month of work and accomplishments! Exploration of numbers and their patterns. Story telling nurtures the imagination. Connecting political and cultural geography. The Art of Practicing to develop skills. Children explode into large layouts with big numbers. The chequer board allows for answers in the millions. Actions: Tie and Untie. Learn by doing. Group activity preparing a delicious treat. Experiments are key to discovery. Exploration of space that can be measured and expanded. Discover the work rotation: night and day. Analysis of words and their function. Out in the world interacting for information. This month flew by in a moment. It was heavily loaded with birthdays and different activities such as the Sleepover. 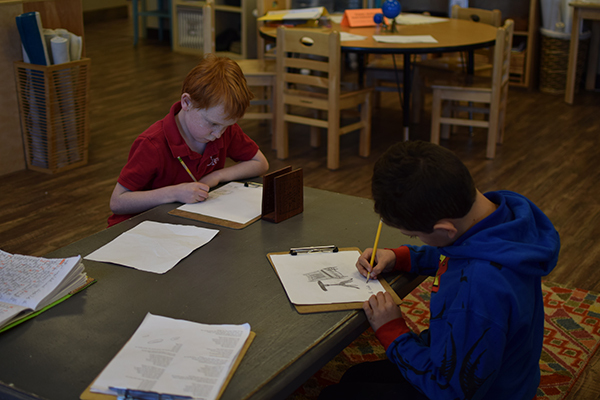 Some students started exploring different history topics: Presidents of the United States, Declaration of Independence, and Migration of Native Americans, while some others calculated the area of the playground and the building where elementary classrooms are located. There was a huge interest in Spanish vocabulary so Ms. Rebeca's lessons got very popular this month. Some of the books that were read aloud touched on grace and courtesy aspects such as respecting personal space and how to deal with jealousy. We also read books about recycling and started a paper recycling project, which led some children to produce their first sheets of recycled paper. This month we also learned two new songs: Green Day's and a song from Peter Pan's musical. The Sleepover was a successful experience organized by the students. Staff from Child's Play conducted activities on improvisation, which the children greatly enjoyed. The following morning we had a Nature Walk to Agritopia farm where children learned about permaculture or how different plants help each other to grow. While at the community garden, the children were fascinated to see sugar cane growing on one of the patches and some children would like to grow it at school. Everything worked out like clockwork and they were proud of themselves. Learning the relationship between nouns (or noun equivalents) and some other words in the sentences. Preparation for addition of common fractions with different denominators. This sensorial work is a preparation for derivation of formula of calculating areas of different triangles. A step to abstraction. This work helps the students to understand the multiplication algorithm clearer. Works that brings math in different aspects, collaborative communication, and appreciation of each other. Taking responsibility and ownership of the classroom on themselves. Different math skills were utilized: measuring and conversion, scaling (division), calculating rectangle areas (multiplication), and, finally, putting it (addition) altogether to find the result. Emphasis is put on capitalization of proper nouns (names). Collaborative work on dynamic addition of big numbers up to millions. Reinforcement of multiplication and elaboration on the work at a more abstract level as well as repetition of the number facts and categories. Learning the idea that people move in order to satisfy various fundamental needs via impressions of the various migrations throughout the course of history. Learning the concept of measurement of time according to calendar conventions as well as the terms BCE (Before Common Era) and CE (Common Era). Spontaneous fascination with lichens and mosses after listening to a book about ubiquitous critters living on the Earth for millions of years. The students are ready to bring their own songs to the classmates to teach them.